By Brían Hoban, Local Historian & Tour Guide. The town is named after a Norman adventurer named De Barrie, who founded a castle here in 1235 (Castle Barry.) By 1400 the time of The Composition of Mayo, the De Burgo Clan ruled here. In 1574 Edmond De Burgo (Eamonn na Feasoige) was hanged following a mock trial at Donomona Castle and his estate confiscated by George Bingham, Governor of Connaught. In 1613 King James 1st of England granted John Bingham a charter of incorporation. Under this charter the town had a Portreeve (Mayor) and a 15-member corporation. It also was entitled to elect two members to the Irish House of Parliament. In 1691 the town being the main British Outpost in Connaught next to Galway, was made a Garrison town. Over the years several regiments of the British Army were posted here including the Welsh and Scottish Fencibles, the 69th Regiment and later the Connaught Rangers. The present barracks was built in 1834 with the entrance pillars at Rock Square being completed in 1831.Portion of the barracks was burned during the Civil War in 1922. This area is especially associated with the Bingham family who resided here from 1584 in The Lawn House. In 1776 Charles Bingham was granted the title Earl of Lucan or Lord Lucan. In 1776 his daughter married a son of Judge Spencer, who had presided over the Maamtrasna murder trials. The Spencer family built a summer residence at Spencer Park. Lady Diana Spencer was great grand daughter of this Spencer. The Third Earl of Lucan was notorious in how he treated his tenants during the Famine. He was known as the Great Exterminator, because he and his infamous Crowbar Brigade evicted so many tenants for non-payment of rents. Thousands died of starvation in the locality, while thousands more emigrated. This trend has only now been reversed. The Fourth Earl was more popular. He reduced the rents, provided the sites for schools and the Catholic Church and in 1888 donated The Green formerly the family cricket pitch to the people of the town. Daly’s Hotel was founded in 1785. It was originally a Coaching Inn. The mail coach from Ballinasloe to Westport used stop here. It still retains some of the features from the Elizabethan Era e.g. the stonework around the doorways, gaslamp over door, oak paneling and fireplace in dining room. James Daly, who along with Michael Davitt founded The Land League here in 1879, owned it in the late 19th century. Across the road from here once stood the hanging tree where patriot priest Fr. Conroy was hanged in 1798. John Wesley laid the foundation for the Methodist Church in 1785. A Bridewell Jail was built next door to here in 1786. It was here that George Robert Fitzgerald- “the Fighting Fitzgerald” of Turlough Park House was hanged in for his part in the murder of Randall Mc Donnell, a neighbouring landowner, in 1786. A monument depicting Lir, Celtic God of the Sea is situated near here in memory of Ernie O Malley, Freedom Fighter. The courthouse was built in 1834. It has some interesting architectural features especially around the windows and the classic Greek Doric columns –one of the first such features made from wrought iron to be used in Connaught. Beside here also is the birthplace of famous Soprano Margaret Burke Sheridan- Prima Donna. Next to this stands the recently renovated Garda Barracks. This building was once the British Cavalry Barracks. The only remnants of the original building are the two statues of lions that once adorned the entrance pillars to the old barracks. As we move around the Green there are four Georgian Houses, once homes of British Civil Servants. On the site of the County Council building The County Infirmary was built in 1834 and was in use until 1932. Dr. Anthony Mc Bride, brother of executed 1916 leader Major John Mc Bride, was resident surgeon here in the early 20th century. The Anglican Church is one of the oldest buildings in the town. The foundation stone (situated inside the main gate) was laid in 1739. The church was renovated in 1828. The churchyard contains the gravestone of the Fraziers Fencibles, a Scottish Regiment killed in action in 1798. This is the only authentic remnant of the 1798 period left in the town. Also situated here is a memorial to Major General George O Malley. George O Malley was a member of an aristocracy family who resided at Ballinvilla and who served with the British Army in North America, Egypt and around the Mediterranean. He was also wounded twice in the Battle of Waterloo 1815. He died in 1847 and is buried in the family burial plot in Murrisk Abbey. This monument was erected in 1948 to commemorate the 150th Anniversary of the Races of Castlebar. Beside this is the grave of John Moore, from Moorehall, who was elected the First president of Connaught following the capture of Castlebar by the Franco-Irish forces. He died in captivity awaiting deportation in Waterford Harbour in 1799. His remains were re-interred here in 1961. The ceremony was attended by the President Eamonn De Valera and was given the full honours of Church and State. Just off this street is Cavendish lane- so called after Lord Frederick Cavendish, who founded the Connaught Telegraph newspaper on St. Patrick’s Day 1828. This is the oldest provincial paper still published in Ireland. The paper has as its Motto: “Be Just and Fear Not.” It was always pro nationalist in its outlook supporting O Connell’s Repeal Movement in the 1840’s, The Tenants Rights movement in the 1850s, the Land League and Home Rule. Market Square was originally known as Shambles Square. A Shambles or slaughterhouse once stood beside the river. It was the main trading area with markets being held on a Saturday. A system of tolls existed where stallholders had to pay a levy to the landlord. There was also a Crane here to weigh farm produce. The lessee of tolls and customs for Lord Lucan was Anthony Faulkner. Several court cases took place between Lord Cavendish and Faulkner over unjust levies and weights and measures. The Foresters Hall stood where Fiona’s Ladies Fashion shop now stands. The Foresters were an organisation founded in Dublin in 1877 by members of the Irish Republican Brotherhood. It was a benevolent society whose aims were to foster the welfare of its members. It later evolved into a social club with billiards and snooker being among its activities. It had its own town band in the 1930’s. The town gasworks stood behind Heneghan’s Guest House. Marsh House, now H.Q for Castlebar urban District Council was once home of St. Claire O Malley B.L, Land Agent for Lord Lucan. Prior to the establishment of a proper road network in the 1860s a landing stage existed here, farm produce and fuel were brought here by boat from the Islandeady chain of lakes. It was later residence to the Feeney family, the last of whom died in the 1960s. In 2001 we celebrated the centenary of the building of the Church of the Holy Rosary. The original church stood on the site between the present church and the De La Salle Monastery. It was a low sized thatched building. In 1872 the Archbishop of Tuam Dr. Mc Hale instructed the parish priest Canon Mc Gee to build a new church. Canon Mc Gee went to the U.S to raise funds and proceeded to build a church where the parish priests house now stands. The church was built to roof level. Around this time Bishop Mc Evilly succeeded Dr. Mc Hale and Canon Mc Gee died. The construction of the church lapsed for some nine years. Dr. Mc Evilly instructed Fr. Lyons to proceed to erect the present church as he deemed the existing partially built church unsuitable. There was unrest in the parish for some time in 1891 over the knocking of the Mc Hale edifice. The disturbances eventually settled down and the present church was completed in 1901. The altar of the church is made of marble, which was imported, from Italy. Pearse & Co from Dublin, father and brother of executed 1916 leader P.H. Pearse constructed it. The altar was donated to the parish by Bishop Ludden of Syracuse, New York who had been born in Castlebar. Famous bandleader, musician and composer Stephen Garvey was organist in the church for 25 years. In the 1940s he fundraised in aid of restoration works, as the timbers in the church had to be treated with Cuprinol due to infestation by the Deadwatch Beetle. Fr. Lyons, who later became a Canon was also responsible for the building of the parish priests house, the boys primary and post primary schools and the Monastery for the newly arrived De La Salle Order of teaching Brothers. The De La Salle Order came to Castlebar in 1888 and remained until 2000. A statue of St. John the Baptist De La Salle, sculpted by Galway Sculptor John Grant, was erected in this street in May 2001 to commemorate the work carried out by the Order in the town. The streets in this area of town took their names from the fact that planters were moved into the area from Northern Ireland in the 1770 s to develop the flax growing and linen industries. The Linenhall was the clearing-house for the linen industry and was constructed in 1790. In 1798 General Humbert also held a victory ball here following the successful outcome of “The Races of Castlebar.” Fr. Ulick Bourke, known as “The Father of the Gaelic Literary Revival” , was reared in Linenhall St. A plaque in his memory was erected some years ago by the local branch of Conradh na Gaeilge. In Tucker Street where Al Muretto, Italian Restaurant now stands was The Rooney Hall, so called after William Rooney one of the founders of the United Irishman and Cumann na Gael. Cumann na Gael was later absorbed into the IRA. Meetings of the IRB, Na Fianna, Cumann na mBan and other republican bodies were held here. New Antrim St. was originally called Shruffaun, a name still used by many older residents. It was so called as a small stream runs underneath it into the Town River. Main Street and Staball Hill. In 1798 "The Year of the French. ", one of the most important events in the history of the town took place. The major battle in which Lord Cornwallis was defeated took place on the Main St. Bridge. Prior to this the British had been chased down the hill, the Franco Irish forces were cheered on by local tenants who shouted: "Stab them All." Hence the name Staball still exists up to the present day. Further up the street on the site of Paddy Fahy’s and the Humbert Inn was Geevy’s Hotel. It was here that General Humbert stayed while in Castlebar. A banquet was held after the rising ands it was here that John Moore was declared first President of Connaught. Next door to here stands Wynnes Newsagents founded in1837 by T.A. Wyyne. In the 1860s photography was invented and Mr. Wynne pursued a career in photography, a move that insured he would go down in history. Collections of photographs, which he left after him, still exist on microfilm and give an accurate account of the social history of Connaught around 1900. The narrow street which turns left off this street is known locally as Castle Lane. A jail once stood at the junction of here and Ellison Street. Stephen Garvey the famous musician was born here. The original course of Castlebar River is thought to have flown through here. The castle and barracks were constructed in a strategic location overlooking the river. A mural depicting scenes from the 1798 period and the Famine times is situated here. The mural gives an excellent resume of the main events in the history of the town and the historical sites featured in the tour. According to many tourists and travellers the best and most exciting way of getting to know any town is to walk around it. 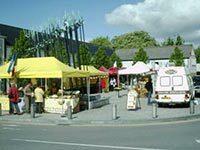 The usual guided historical walking tours of the towns of Castlebar and Newport continue throughout the months of July and August. Brian Hoban, who has been giving informative and enjoyable tours of his native area for the last six years, is an approved Tourist Guide and local historian. Brian is recognised as a heritage specialist by the Irish Heritage Council and works with "The Heritage in Schools Scheme"- run jointly by the Irish Heritage Council & the I.N.T.O. Why not join Brian as he makes history come alive in his unique and informative tours? The Historical Stroll of the town of Castlebar starts from The Imperial Hotel each Tuesday & Thursday at 7p.m, while the Newport tour starts from Hotel Newport each Friday at 7p.m. Tours are leisurely and suitable for all ages. Tours take approx 90 minutes and costs 5 euro (U-12 free accompanied by adult). No reservation is required. Group discounts for 10 or more persons. (Brian can also be contacted via 4 Sale by Owner +353 94 90 25577). A Walking Tour of the Mall, Castlebar, in conjunction with Positive Ageing Week, will take place exploring its history with local historian Brian Hoban on Sunday September 28th . 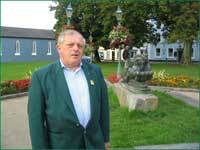 Meet at The Courthouse, The Mall, Castlebar at 2.00pm. Tour will take place at a nice relaxed pace (fully wheelchair accessible) and will suit all levels of mobility. Duration of tour will be 1 hour approx. Positive Ageing Week is a festival, which highlights the positive aspects of ageing and celebrates the contribution older people have made and continue to make to their communities. The central aim of Positive Ageing Week is to dispel the many negative perceptions that surround ageing and to transform attitudes towards ageing and older people. We need to celebrate the fact that we are living longer, that ageing is not a burden but an opportunity.